Halo: The Master Chief Collection is about to get some major updates that will drastically rework code and improve functionality, courtesy of a small team within 343 Industries dedicated solely to supporting old Halo games. Normally this would be good - if somewhat expected - news. What makes this particular turn of events notable is that it's currently February 2018, more than three years on from Halo: MCC's original release date of November 11, 2014. It's not like this hasn't been coming for awhile, either. MCC was famously lambasted for unreliable matchmaking, sluggish performance, and general clunky bugginess. So what's on the docket for the future? "The older system used outdated methods which sometimes resulted in instances of parties disappearing randomly and lost notifications between clients and the matchmaking services. Xbox Matchmaking services would find you a match but the notification might get lost on the way to the system and then the game title itself would never see it. ... Under the old model the system software was the authority on who was connected to who and how... and now, the game title itself takes responsibility for that and gets to decide what the party composition is. This gives the title (and us) a lot more control over party management." So basically, it used to be that MCC relied on your Xbox One's software to decide who and how you connected to other players. With this update, the game will handle those processes, thus putting more control into 343's hands and strengthening connections. As for "XDK," that's shorthand for Xbox Development Kit, which is... well, it's pretty self-explanatory, right? 343 is going through and updating all eight of the games included in MCC (Halo: CE, Halo: CE Anniversary, Halo 2, Halo 2 Anniversary, Halo 2 Anniversary Multiplayer, Halo 3, Halo 3: ODST, Halo 4) to be more compatible with the latest XDK. Ideally, this would mean things like custom game session browsing, as well as Xbox Arena and Mixer support. If you're playing on Xbox One X, this should also result in increased resolution and other visual enhancements. Despite this being an improvement to user interface, players may not see much of a difference here. Instead, the 343 Legacy Team will be focusing on a more deep-rooted problem: how MCC actually treats each game. In the original version of MCC, launching one of the eight aforementioned games would cause one of eight separate engines to launch. Once you closed out of that game, the software would reboot, often leading to a breakdown of network stability over time. Hermann explained how his team will be changing this as well: "Now instead of doing a reboot of the entire process, we just unload the .DLL and cleanly shut down each game engine. This means there’s less chance of your network session breaking down. You’ll also notice a much faster game-to-game transition time, greater overall UI consistency, and it also makes it easier for us to manage MP experiences and get players back into matchmaking quicker after a game session ends." If you've ever gotten frustrated with your inability to join a multiplayer match due to NAT setting errors, this next change is for you: the 343 Legacy Team is working on routing more data through relay servers regardless of your own NAT settings, which should result in fewer lost / slow connections. This is partly due to the updated APIs and moving more of the connection responsibilities to MCC rather than the Xbox One. Customizing how a single game communicates across the internet is far easier than tweaking an entire platform's baseline. 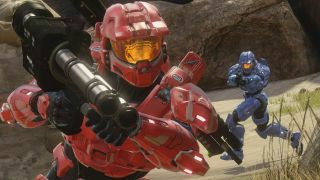 But hardware is important too, which is why 343 is doing away with peer-to-peer connections for matchmade games. While dedicated servers were the default in the original version of MCC, the game would switch to peer hosting as a fallback if it needed to. Once the update is live, dedicated servers are guaranteed for any games played via matchmaking. 343 plans to roll out many of these changes (or at least get the foundation for them laid) by spring 2018, but there are more, as-of-yet unannounced tweaks to come. If you want to be on the front lines of testing, be sure to join the Xbox Insider Program and the Halo Community Feedback Program. As for the rest of us: it sure has been one hell of a wait, but if it means a significant upgrade to performance, I say better late than never.